Root > Tools > Viewer > How do I...? > ...view a report? Note: exact default action for double-click depends on your settings. This command will open Viewer for viewing locally saved bug report file (e.g. 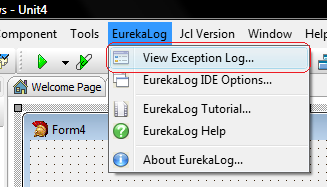 usually this is something like C:\Users\YourUser\AppData\Neos Eureka S.r.l\Bug Reports\YourApp\YourProject.el). If there is no such file - nothing happens. • Complex environment variables (such as current date-time) may prevent this option from working.